We began the Solar Month of Gemini on Friday as the last 48-hrs. of Mercury’s (planetary ruler of Gemini) retrograde holds us accountable and cautious regarding matters of communication. Very opportune, giving the Full Moon’s energies of Sagittarius and the potential to allow the seeds of our catalytic will to be carried out into the world; arrows aflame! Think of this space of time as the additional care to be given as the archer’s bow and arrow are aligned precisely where we wish to hit the mark of change and stimulate new growth. This is one of two Full Moons that will wear the mantle of Sagittarian energy, the second occurring next month on June 20th and will be in its 29th degree wearing its developed and mature garb. This Moon heralds the first steps in stepping into Sagittarius’ energy at the 1st degree. Even, this dynamic is one that we can harness, using this Full Moon’s energy with a similar intention of cycle that flows from New Moon to Full Moon. 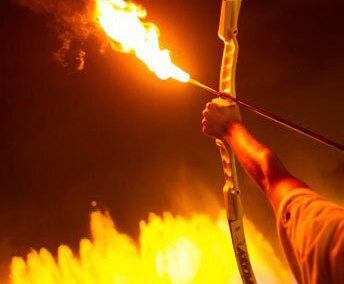 Apply this to the waxing of Sagittarius’ fiery energy: this Full Moon sees the first picking up of the bow that will then hold the arrow of intention that are released and, if sure and true, will hit its mark and become the fullness of flame (at June’s 29th degree Full Sagittarian Moon) and heat that cause lasting change! Pretty cool, isn’t it? On the longest day (Summer Solstice) when Father Sun crests in his vitality and strength, that heat is cooled by Mother Moon’s waters of fiery and quickened intent (Sagittarius). Their dance is a Tango, passionate and flowing, yet sharp and precise in the pointed nature and intention of each gesture and posture (the sharpened arrows of Sagittarius). He gives the full burst of energetic response, his emotions rising in heated desire (Transit into Cancer and waters enlivened by Sun’s rays) with each caress and entwining of embrace. The celestial music plays and as the day’s energies wane, the dance slows as the consummate union of Sun and Moon, Masculine and Feminine, Fire and Water herald the promise of new creation. Rewind to this Full Moon of May: This is the space of planning, practicing and preparing for whatever the bull’s eye of your intention is. Bows raised in the first release of intention that we seek to enliven with the fires of change. Sights set on what will be catalyzed. Breathe deeply and let go! With the help of the Sun in Gemini, and its last efforts (Retrograde until Sunday, May 22nd) at slowing things down enough to give your intentions time to communicate with your actions, we have greater potential of actually hitting the goal with fewer attempts. An additional dynamic to this Full Moon energy is a conjunction formed between the Moon and Retrograde Mars in Sagittarius. A conjunction occurs when the planets involved are within an orb up to 10-degrees of each other. In this case both the Moon and Mars are at 1-degree aspects. Mars energy is active, assertive and can serve productively if positively directed. The retrograde intensifies the need to be active, so impulsivity or spontaneity can be favorable in allowing for flexibility of change or derailing the best efforts. This also means that tension will arise and the tautness that occurs replaces flexibility with rigidity. But, tension, more accurately just the right application of tension can bolster the efforts of Sagittarius’ natural predisposition towards outreach and action. This ties in well with the directive of Mercury and its retrograde putting extra pressure on detail and precision in communication (or letting those arrows fly). Envision this Mars-Moon conversation as one of emotional desire (Moon) that is allowing the will towards action (Mars) to assist in the co-creation of of change and broader dialogue that reaches beyond (Sagittarius) the normal boundaries that we often self-impose. As the light of this blessed Full Moon shines stand in the space of your readiness to ignite the night sky with your arrows of action and intention…. Sky held in timeless magick. Perfection of our profound union. We just celebrated the Sacred Union of Beltane’s Lord and Lady, so it is fitting that this New Moon in the astrological sign of Taurus is one of beginnings that may flow through all of our manifest endeavors. I have chosen the Egyptian Goddess Nuit as the image and energy for this New Moon. She is an ancient Goddess of the Heavens and her brother, Geb lay beneath her as the embodiment of the Earth. 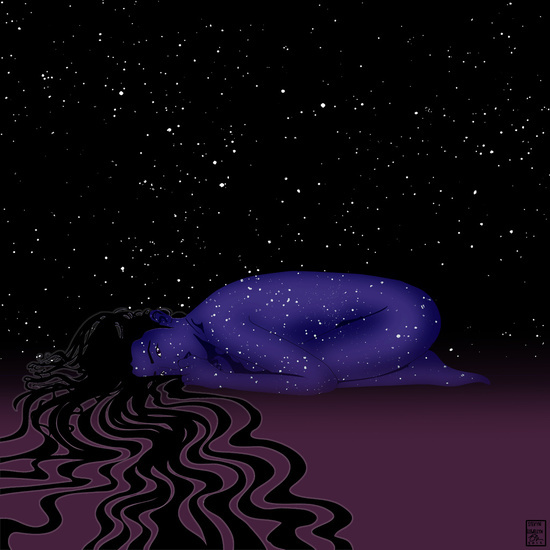 Her body is that of the blackened starry night and within that mantle lay the potential of planet and luminary to shine as they will adorning her form. The union of Geb/Earth and Nuit/Sky held the space of the between from which life and the quickening of form drawn down into fertile space of ground could become. The cloak of Taurus calls us to be present in all of our physical workings. ; and as it adorns the strength of the Solar God it illumines the way for what this bull of longevity and commitment chooses as its focus of protection. Nuit wearing the veiling of Taurus provides the promise “as above, so below” that bodes the nurturing of the cosmos and the life contained within her. The Moon lay hidden; embedded in Nuit’s creative waters. Sun and Moon find their way, entwining and moving in the ecstasy of promised union. This is the calling of a new moon’s beginnings. This is the space of breath just before the exhale that gently feeds what will blossom forth in fullness in the weeks ahead. Look up to the blackness of the night sky, knowing that Nuit’s Moon surrounds you. You, who stand on the form of her lover, Geb and for a moment in time, seed and womb becomes as one. What will you manifest this night?